Did #Nostradamus find a cure for #Black Plague? The rose-petal tonic that Héloïse, my heroine of Blood Rose Angel (novel about the 14th century Black Plague in France) concocts to try and stop the plague spread is based on that of Michel de Nostradame, two centuries after the first outbreak. Better known by his pseudonym, Nostradamus was one of the most fascinating personalities of 16th century France. On completion of his medical studies at the University of Montpellier, Nostradamus took to the countryside with his medical and astrological books and assisted in the care of Bubonic Plague victims. He prescribed fresh, unpolluted air and water and clean bedding, removal of the corpses and orders to clean the streets. Each morning before sunrise, he oversaw the harvest of rose petals which he then dried and crushed into fine powder, and made his “rose pills”. Patients were advised to keep under their tongues at all times without swallowing them. Nostradamus believed the plague was spread by contaminated air and that clean air protected people, but perhaps his success lay in the fact that fleas, which transmit the disease from rats to humans, were repelled by the rose pills’ strong smell, so at least the healthy didn’t catch it. Whatever the reasons, Nostradamus was reputed to have saved thousands from plague in Narbonne, Carcassonne, Toulouse and Bordeaux. Take one ounce of the sawdust or shavings of cypress-wood, as green as you can find, six ounces of Florentine violet-root, three ounces of cloves, three drams of sweet calamus, and six drams of aloes-wood. If these two are added I do not doubt that you will produce a superbly pleasant perfume. Pulverise the said musk and ambergris, dissolving it with rose-juice, then mix it in and dry in the shade. 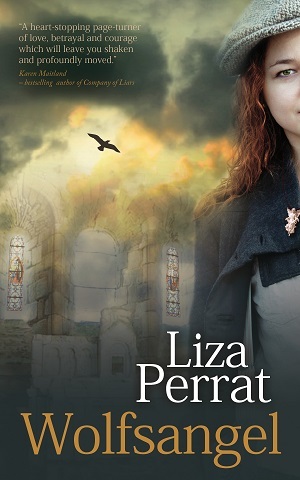 EXTRACT from Blood Rose Angel (third in The Bone Angel Trilogy: 3 standalone stories exploring different generations of a French village family against backdrops of the 1348 Black Plague, the French Revolution and WW2 Nazi-occupied France). 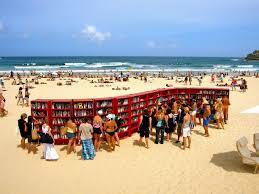 #Readers do you read every #book you purchase? On my husband's way out to work this morning, I checked the letterbox, as usual. Another book I'd ordered had arrived. As usual. I held it up to him as he drove off, and he just smiled and shook his head. Another book? Yes, just the next one in a near-continuous stream of books I purchase. 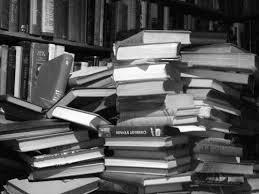 But do I read them all? No, not even half of them. Perhaps not even a third. In my old age, having always been a voracious reader, and with so little leisure time these days, I've become super picky about my reading matter. If it doesn't hook me in the first few pages, I'll not bother finishing it. Too many typos or grammatical errors? More reasons to chuck it aside. What about you? Do you read every book you buy ... doggedly slogging on to The End, even if you hate the story, in the hope it might pick up? Or do you give up, like me, early on in the piece? I'd love to hear your thoughts on this, if you'd like to leave a comment. 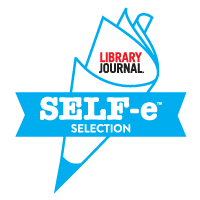 Based on a tragic war crime that occurred in a small village during Nazi-occupied France, #Wolfsangel #WW2 novel has been listed in the Top SELF-e eBooks of 2015. To read about the tragedy behind the novel, click here. During a recent trip to London I was excited to come across an incredible altarpiece in the Victoria & Albert Museum, one of London's most magnificent museums. This intricately carved altarpiece tells the story of Saint Margaret, martyred for refusing to renounce Christianity. 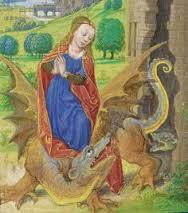 Famous for her imprisonments, and subject to tortures for her Christian commitment before finally being beheaded, Saint Margaret's most remarkable imprisonment was within the belly of a dragon. The wooden cross she held so tickled the dragon’s insides that he belched her forth. 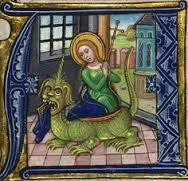 She is thus often depicted subduing a dragon and is the patron saint of childbirth. In the enigma of the bone-sculpted angel that links the generations of women throughout The Bone Angel trilogy, Saint Margaret and her story feature in Blood Rose Angel, 3rd novel in the trilogy. Our hoods pulled snug around our faces, extra blankets shrouding our cloaks, Morgane and I sat on a snow-shrouded log in the misty garden. ‘I’ve told you of Saint Margaret,’ I began. Blood Rose Angel is available here. If you liked this post, why don’t you go ahead and sign up for occasional book news and a FREE COPY of the story that inspired The Bone Angel series. Just click on the angel icon.